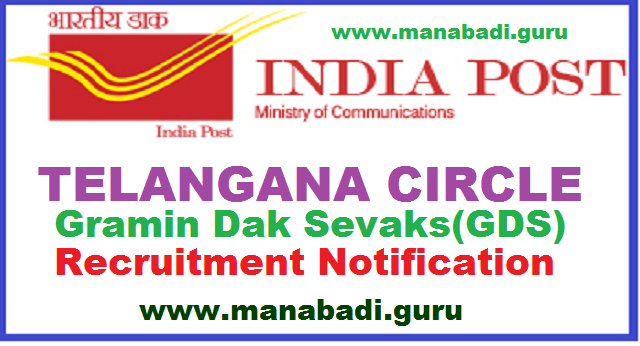 Govt Of India, Department of Post, Telangana Circle has published the Gramin Dak Sevaks(GDS) Recruitment 2017 notification/ India Post TS GDS Posts Recruitment 2017 and Applications are invited by the respective appointing authority as given in the annexure ‘B’ against each post, from eligible candidates for the selection and engagement to the posts of Gramin Dak Sevaks under TS Circle as listed in the Annexure. The candidate applying for the post shall note that he/ she will have adequate means of livelihood to support himself/ herself and his/ her family from other sources so as to have to supplement his/her income. However, this shall not be a pre requisite for candidates for the purpose. Selected candidate shall be required to comply with this condition within 30 days after selection but before engagement. The candidate shall furnish an undertaking in the application itself that he/ she has other sources of income besides the allowances to be paid by the Government for adequate means of livelihood for himself/ herself and his/her family. The candidate after selection as Gramin Dak Sevak shall have to give the undertaking again before engagement. 1.No person holding an elective office will be considered for engagement to the post. 2.The candidate selected as Gramin Dak Sevak shall not engage in any activity with any outside agency which would be detrimental to the business or interest of the Post Office. 3.Past experience or service of any kind will not be considered for selection. 4.Cycling knowledge is a pre-requisite condition for GDS posts attached with outdoor duties. 5.A Gramin Dak Sevak shall be outside the Civil Service of the Union and governed by GDS (Conduct and Engagement) Rules 2011 as amended from time to time.